The Basics Roulette is not a very difficult game to learn how to play and it can be very fun and rewarding. In roulette the players play against the house by betting on the outcome of colored numbers on a wheel. The casino is represented by a croupier, also known as the dealer or banker, who spins the roulette wheel and handles all wagers and payouts. After you place your bets, the dealer spins a small white ball in the opposite direction of the turning wheel. When the ball comes to rest in one of the slots, the dealer will call out the winning number and settle all bets. To win at roulette a player must predict where the ball will land at the end of each spin. The roulette wheel itself has 37 or 38 numbered slots, numbered 1 through 36, zero, and sometimes double zero. The double zero is only on American roulette wheels. Even numbers are colored red and odd numbers are colored black. Zero and double zero sections are green. The house advantage is 2.7% for single zero tables (European wheel) and 5.26% for double zero tables (American wheel). 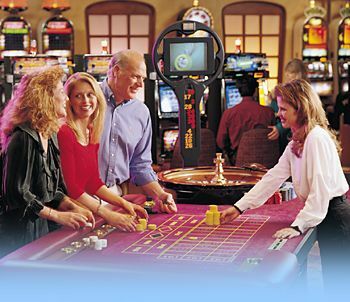 A roulette table usually accommodates 6 to 8 players at one time. Each player is assigned a different color chip to place bets with. This is done to keep track of which player is placing each bet. When you initially put down your money the croupier will give you a corresponding number of chips in one color. Each colored chip represents one betting unit for the denomination roulette table you are playing on. If the table is a $1 table then each chip in worth $1. When you win you will be paid in colored chips until you are ready to collect your winnings and move on. If you're just passing through and you want to place a quick bet on a certain number or on one of the other areas of the layout, you don't have to ask the croupier for a color. It is perfectly acceptable to put the house's chips, or even cash, down on the layout. If you win you will be paid in casino chips. However, if you're planning to play awhile it's best to sit down and get a color. There are several different bets in roulette. There are bets on individual numbers or groupings of numbers, called "inside bets". There are also more general bets on large sets of numbers, called "outside bets". These are discussed in more detail in the next lessons. As you play you will need to meet the posted minimum bet requirement. If the minimum bet is one dollar and you are playing 25-cent chips you need to play at least four chips bringing your total bet to $1. Many tables separate the outside from the inside when meeting the minimum bet requirements which means you are not allowed to split the minimum bet between the inside and outside betting areas. If you chose to play both you must meet the minimum both inside and outside. For example, on a $1 minimum table you must play at least $2 if you want to play both the inside and the outside betting areas, at least $1 inside and at least $1 outside. Also, each individual outside bet must usually meet the minimum requirement. If you want to bet on Even and Red you must bet at least $1 on each bet. Players place their bets on the roulette table themselves before each spin. A few moments after the croupier starts the spin the ball will begin to drop. At this point he will call "no more bets" and wave his hand across the table. No more bets can be placed and the bets on the table cannot be changed in any way. If you try to touch your bet after this point the croupier will not be very happy with you. When the ball drops onto a number the croupier will place a plastic marker on the winning number on the roulette table, collect losing bets and pay winning bets. You must wait until the croupier removes the plastic marker before picking up any winnings or placing the next bet. Not being patient and waiting is another good way to get on the croupier's bad side. Roulette tends to be much slower paced than most casino games. Always remember that roulette play is completely random and has nothing to do with any previous spin outcomes. Just because red came up the previous six times doesn't mean black is "due" to come up. The roulette wheel is completely unbiased, has no memory, and no target payout percentage. A roulette table displays the numbers 1 through 36 in twelve horizontal rows and three vertical columns. The first row contains 1-2-3, the second 4-5-6, and so on. This section on the table plus a green section for single and double zeros constitute the inside betting area. There are several different inside bets that can be made. A one-number bet is made by placing chips in the middle of the section displaying that number. This is the highest paying bet in roulette. It is also called a straight-up bet. The bet pays 35 to 1. You can bet on two numbers by placing your chips on the line shared by two adjacent numbers, for instance 1-2 or 1-4. This is called a split bet. The payout for a split bet is 17 to 1. A three-number bet is called a street bet or trio bet. This bet is made by placing your chips on the outside edge of a row, for instance 7-8-9. This bet pays 11 to 1. A four-number bet is made by placing your chips on the corners of a block of four intersecting numbers, for instance 2-3-5-6. This is known as a corner bet. The corner bet pays 8 to 1. You can bet on six numbers by placing your chips on the edge of two adjacent rows, covering the shared corners, for instance 1-2-3-4-5-6. This is known as a line bet. The payout for this bet is 5 to 1. You can also bet on inside numbers in combination with the zero sections. This can result in a five-number bet with a payout of 6 to 1. Betting on single or double zero is the same as betting on any other number. Along the left side and bottom of the inside numbers are the outside bets. There are several different kinds of outside bets you can make. All outside bets can be made by simply placing your chips in the betting area. At the bottom of the inside betting area are the column outside bets. There is one outside betting section for each of the three columns of numbers. A bet on one of these is a bet that one of the 12 numbers in this column will come up at the end of the spin. The column bet pays 2 to 1. The rest of the outside bets are located along the left edge of the inside numbers. There are three outside bets called dozen bets on groups of twelve numbers, low (1-12), middle (12-24), and high (25-36). This bet pays 2 to 1. There are also three kinds of even bets. These are Even or Odd, Red or Black, and Low (1-18) or High (19-36). Each of these bets pays 1 to 1, even money. There are two special rules sometimes offered for even bets. Not all casinos offer these rules. The 'en prison" rule allows the player to take back half of his bet or leave the bet if the outcome of the spin is zero or double zero. If the bet is left and the next spin is again zero, the whole bet is lost. The 'la partage' rule is similar to the en prison rule only the player automatically loses half the even money bet, with no option to leave the bet for another spin. Both of these rules lower the casino's edge. On a single zero table the house advantage is cut to 1.35% and 2.63% on a double zero table.